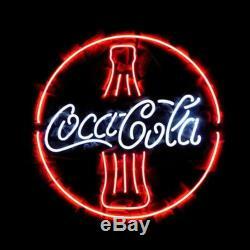 17"x14" COCA COLA COKE BOTTLE REAL NEON LIGHT SIGN STORE DISPLAY BEER BAR Lamp. MOUNTED ON A METAL FRAME WHICH MEASURES 43x35cm/17"X14", COMING WITH HANGING CHAIN. 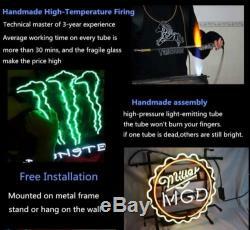 100% Glass Tube-Brand New from factory. Power: 110 to 240V; US 2-Pin Plug. Stand or hang on the wall. Color: As shown in the picture. Please note that the color may vary slightly from the photo you see on your computer. Please message me if I may meet your needs of different colors or patterns. Because the tubes are separately joined, if some is damaged, we can replace it repectively. Thus please send us a picture whlie the unit is powered on. Items unpaid after 4 days will be subject to an unpaid item dispute. Most orders could arrive in 10-40 days. IF YOU LOSE PATIENCE WITH WAITING , please MESSAGE US, We'll try to offer a solution to YOUR SATISFACTION, DO NOT OPEN ANY CASE OR LEAVE BAD FEEDBACK. The item "17x14 COCA COLA COKE BOTTLE REAL NEON LIGHT SIGN STORE DISPLAY BEER BAR Lamp" is in sale since Sunday, August 23, 2015. This item is in the category "Collectibles\Lamps, Lighting\Neon". The seller is "joyc365" and is located in ShenZhen. This item can be shipped to North, South, or Latin America, to all countries in Europe, to all countries in continental Asia, to Australia.